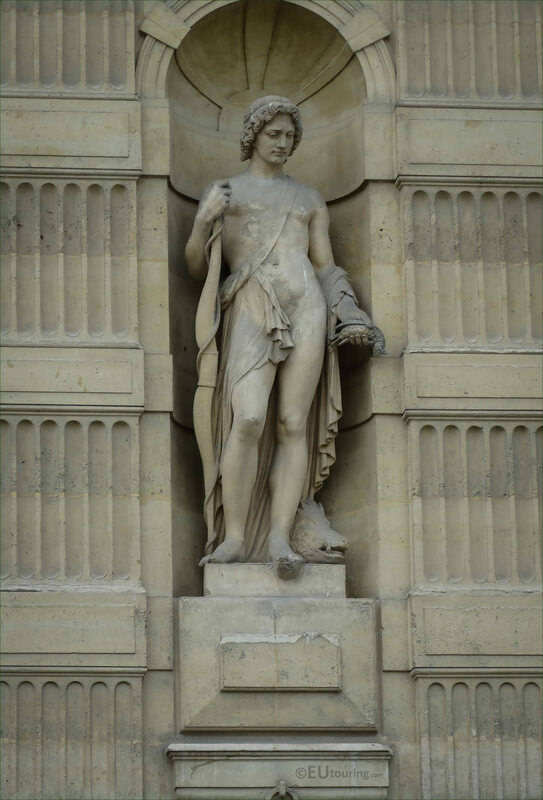 We were again at the Musee du Louvre in the 1st Arrondissement of Paris when we took this high definition photo of a statue called Meleagre, which can be found on the facade of the Aile de Flore within the Cour du Carrousel, and was sculpted by Pierre Travaux. This was sculpted as an allegorical statue depicting Meleagre, which in English translates to Meleager, and in Greek mythology he was classed as a hero associated with the Calydonian boar hunt, which was a large boar that in mythology had been sent by Artemis to ravage the region of Calydon in Aetolia. And this was produced by Pierre Travaux who was the son of a stone mason born in 1822 and in 1847 entered the workshop of Francois Jouffroy at the Ecole des Beaux Arts to become a French sculptor, and started to receive commissions for different statues and sculptures on famous tourist attractions in Paris including this one of Meleagre and five others for The Louvre. So Pierre Travaux had a successful career including several commissions for the city of Marseille as well as in the capital city, yet it was short lived as unfortunately he passed away in Paris only days after his 47th birthday in the March of 1869.